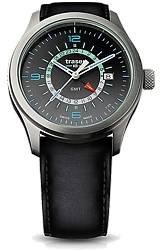 Traser Watches, the world leader in Tritium Technology, has added a collection of true Pilot's Watches that have both an independent 24 hour subdial and full tritium illumination, to their impressive collection of fine SWISS Watches. Introduction the all new P59 Aurora GMT Pilot's Watch, is a true dual time zone, 24 hour timepiece with a fourth hand to easily indicate 24 hour time for any time zone you desire. 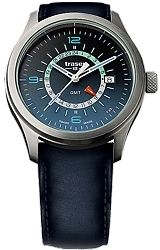 The gradiant color dial adds a touch of Swiss sophistication to the overall design and is great looking, too. The watch also uses a combination of Lumi-Bright Luminous paint and Tritium Illumination to light the dial insuring maximum visibility day or night. 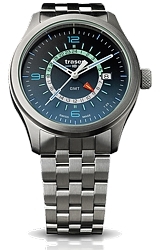 There is Tritium Illumination on all hour markers and on ALL HANDS, including the 24 hour hand. The 24 Hour subdial is also fully illuminated with Tritium. 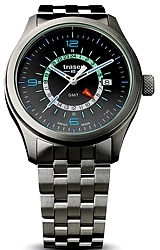 Traser P59 Aurora GMT collection includes four model choices, all with stainless steel cases, anti-glare coated, scratchproof sapphire glass crystals and with depth tested water resistance down to 100 meters or 330 feet below sea level.